St Joseph's Catholic Church is located on the corner of Walz Street and Parker Street, in the southern suburb of Rockdale. It stand beside St Josephs Primary School which was built in 1929, originally as a church and school. 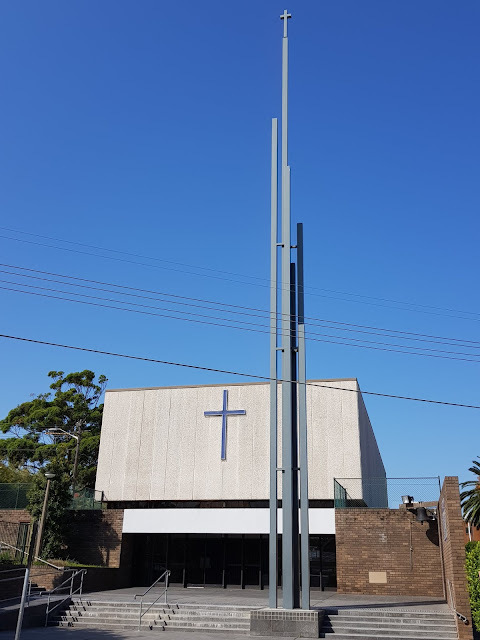 When the school needed to expand, this new church was built alongside it in 1967. Linked to: Skywatch Friday, InSPIREd Sunday. It certainly looks quite modern. Exactly so! Not like some of the gorgeous late Victorian churches usually in this blog. Hello, nice modern looking church! Enjoy your day and have a happy weekend ahead. I see that Australia has some bright blue skies too! Gorgeous blue skies! Rain here for the last four days. Nice capture. Hey my daughter is in Sydney today. She flew into Melbourne to be with her friend. She says it's really really hot! It sure is, Jocelyn. We're right in the middle of a heatwave and there are some record high temperatures predicted for today, especially in other parts of Australia. The blue sky provides a beautiful background! What an unique looking church, I like it. The blue sky you can't beat it, we hardly have one that's so blue. Not my idea of what a church would look like...main thing though that it is functional. What is that pole structure in the front? Stanley, I suppose it's a modern idea of a spire with a crucifix on top. Thank you that I could see him. ...this church looks like several that were built here in the '60s. What doe you call those poles? Are they spires? A modern version of a spire, I suppose.